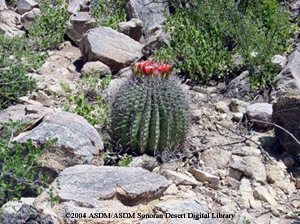 The fishhook barrel cactus (Ferocactus wislizenii) can be identified by its thick (2 foot diameter), barrel shaped body and long hooked spines. The yellow/red flowers and yellow fruit always grow at the top of the plant. Fishhook barrel cactus grow along desert washes and gravelly bajadas. It is less likely to occur on valley floors or rocky slopes. This species of barrel cactus is found in south-central Arizona and northern Sonora, Mexico. There are scattered populations in southern New Mexico and western Texas. Its life span is 50-100 years. This cactus commonly grows 2-4 feet but may grow taller can grow to be 6-10 feet tall. It can reach a diameter of 18 to 30 inches or more. The Fishhook Barrel Cactus is often called the "Compass Barrel " because some of the larger plants lean toward the southwest. This cactus does contain water, but the water contains oxalic acid and is likely to cause diarrhea if ingested when the stomach is empty.